While it might not have the immediate heirloom appeal of other $10,000 watches, the materials used in the highest-end Apple Watch could potentially run the cost up that high. It might just be another smartwatch to some, but to Apple, its Watch is clearly meant to be more than a "wearable." 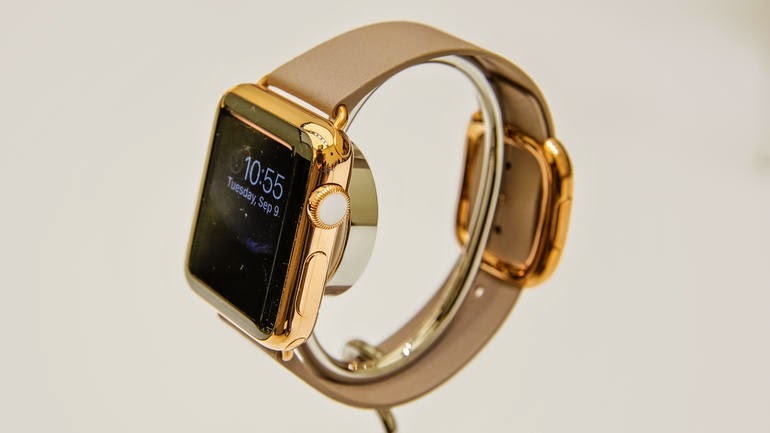 At its announcement in September 2014, the company said the Apple Watch would be available in three different collections: an entry-level aluminum-and-glass Watch Sport, a midrange Watch made of steel with a sapphire crystal, and an 18-karat-gold-and-sapphire-crystal Watch Edition. Apple said the Watch Sport would start at $349 in the US (which converts to about £230 or AU$450), but that was the only price given to date. Since then speculation on pricing for the highest-end Edition collection has been pegged to starting prices of $5,000 to $10,000. The latter is the most recent estimate from Daring Fireball's John Gruber, who actually estimated the former at the time of the announcement. That's a starting price of over £3,000/AU$6,000. For however outlandish those prices might sound, it's pretty easy to find luxury watches -- from brands big and small -- made of those materials with similar price tags and much higher depending on other features. For example, at $9,200 you can get a men's 18-karat solid rose gold Carl F. Bucherer Adamavi watch, while a women's Tag Heuer 18-karat solid rose gold watch sells for $8,900. Those are watches that simply have the time and date and alligator-leather straps. "It's not crazy," says John Biggs, founder of watch site The Wrist Watch Review and TechCrunch East Coast editor. "Watches made of precious metals are massively more expensive than steel models and the systems required to make a nice gold case are expensive." Biggs added that $10,000 sounded really high, but the market -- as evidenced by the popularity of gold jewelry in general -- could bear it. Of course, this is a smartwatch and although Apple's products hold their value better than most other mobile devices, spending thousands on a first-generation watch that will eventually be filled with outdated technology might be an issue. It's likely not going to be the type of watch you pass down to your kids. Then again, there is certainly a market for luxury mobile devices, as evidenced by companies like Brikk, Feld & Volkand Falcon that customize iPhones with gold and diamonds, among other things. In fact, Brikk recently announced a preorder of the Lux Watch, an Apple Watch plated in 24-karat yellow gold, 18-karat pink gold or 950 platinum and studded with diamonds with a starting price of $7,495. Plus, a good story goes a long way, so Apple's use of 18-karat gold that its "metallurgists have developed to be up to twice as hard as standard gold" certainly adds to the Edition's mystique. Also, since its band can be easily swapped out, it's likely that diamond-encrusted or solid-gold straps could be made available, driving the price through the roof. So just remember when social media goes crazy about an outrageously high price for the Watch Edition, it's not out of line with the rest of the luxury watch market.